Stephany Papili never expected to climb the ranks from teacher to principal barely seven years after earning her bachelor’s degree from Miami Dade College’s School of Education. The affordable tuition, comprehensive training and networking opportunities she received at MDC not only launched her teaching career – they started a new, fulfilling chapter of her life. Papili is just one of many success stories to emerge from Miami Dade College, which makes its mark on every facet of the community. Beyond its far-reaching economic impact – estimated at $3.4 billion a year – MDC enriches Miami-Dade County through its unmatched student enrollment numbers, academic achievements, job-placement rates, nationally recognized cultural profile and more. Meeting the needs of the Miami community has always been central to the evolution of Miami Dade College. Originally a community college awarding two-year degrees, the College currently offers a broad selection of academic pathways and degree programs – including college credit certificates, associate degrees and bachelor degrees – in response to local demand for teachers, nurses, data analysts, engineers and others. In 2003, the School of Education began offering four Bachelor of Science degrees to meet critical teacher shortages in the area. 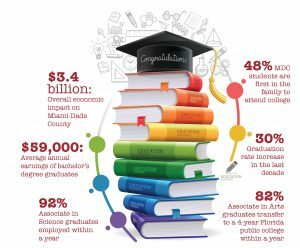 More than 90 percent of School of Education graduates are immediately hired to work for Miami-Dade County, with an average of 160 teachers graduating and joining the county workforce each year. “Not many people choose teaching as a career, and even less choose to teach math,” said recent alumna Yadira Rivera, who earned a Bachelor of Science in Secondary Mathematics Education and is now a fourth-grade math and science teacher at Coconut Palm K-8 Academy in Homestead. Both Rivera and her identical twin sister, Yarinet – who was offered a full-time teaching job during her last semester – graduated from MDC in late 2017. MDC also works closely with local businesses to fill jobs in other critical fields. The Benjamin León School of Nursing at MDC, Medical Campus began offering a Bachelor of Science in Nursing (BSN) in 2008 in response to workforce needs in that industry. To expand its reach, in 2017 the School of Nursing partnered with Jackson Health Systems to provide an on-site, 18-month bachelor’s degree program for licensed registered nurses. Richard Prentiss, interim president of MDC, Medical Campus, said only 50 percent of nurses employed by the Jackson hospital group currently have a bachelor’s degree. “BSN-prepared nurses not only have the opportunity to earn more; research shows they have increased employment opportunities and better patient outcomes,” he said. In addition to its bachelor’s programs, MDC offers associate degrees and college credit certificates to prepare workers for careers in growing fields such as information technology, digital forensics, emergency medical technician services, hospitality and tourism management, and paralegal studies. 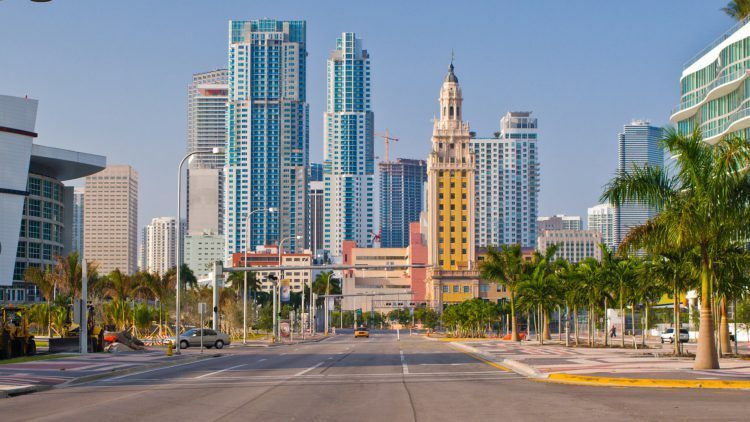 As a hub for international business and immigration, Miami attracts many foreign professionals who lack credentials to work in the United States. The College’s Foreign-Trained Professionals Program is designed to help foreign nationals earn an MDC certificate or degree in their area of expertise so they can quickly return to their career of choice. Moreover, as part of its longstanding commitment to serving diverse communities, MDC’s English as a Second Language, or ESL, program teaches English to non-native speakers. The college also offers GED instruction and career counseling to students who want to continue their education. Residents also can gain new professional or occupational skills at MDC’s School of Continuing Education and Professional Development. The School’s Center for Corporate Solutions – which offers training in customer service, nonprofit management, information technology and more – has connected students with jobs at major Miami employers, including Jackson Health System and the Greater Miami Convention & Visitors Bureau. With more than 90,000 credit students, MDC has the largest student enrollment of any college or university in the country. The College employs nearly 9,000 full- and part-time employees. Due to its robust student population and workforce, its vast alumni presence and its sponsorship of prominent cultural events such as Miami Book Fair and Miami Film Festival, MDC has become a driving force of the Miami-Dade economy. From 2015-2016, MDC, its students and its local alumni contributed $3.4 billion in income to the county. MDC Executive Vice President and Provost Lenore Rodicio said the College’s bachelor’s degree graduates earn an average annual salary of $59,000 – more than $10,000 higher than Miami-Dade County’s median household income. “Our workforce and degree programs are developed in conjunction with industry leaders, ensuring that they address desired skills noted by employers and giving our graduates a leg up in the employment process,” Rodicio said. The accessibility, diversity and sense of community at Miami Dade College all were factors in principal Papili’s decision to go back to school and earn her bachelor’s degree after a decade of working part time, substitute teaching and raising her two daughters. When graduation approached, she was pleasantly surprised. Instead of searching for work, Papili was almost immediately offered a position as a reading teacher at Miami Community Charter School. From there, she got a series of promotions: head of the reading department, exceptional student education program specialist, assistant principal, and now, principal.